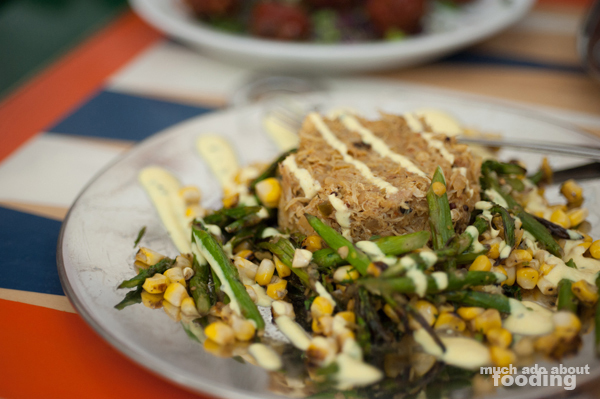 Has it already been one year since ADYA opened its doors at the Anaheim Packing House? The time difference from when the packing house was announced to when it opened made its first year of operation fly by without much fanfare. After all, Orange County knew about the plans many years before its execution. As each of the eateries inside start to celebrate their first anniversary, we applaud their making it through the first year of business. Opening any business is difficult enough but restaurants tend to run into many complications so a big congratulations to ADYA and Chef Shachi Mehra for hitting this milestone! We have always enjoyed her food on our multiple visits so were excited to join her and others for a celebratory dinner one evening. 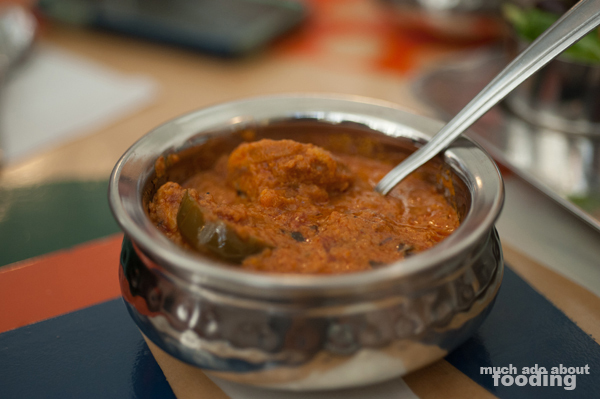 ADYA, if you don't know of it, serves up Indian cuisine but with a focus on street food. The menu is not restricted to a particular regional style of dishes; rather, it is keen on flavor and showcasing the enormous array of food that comes with such a culture rich in history and spices. Bright flavors and uncommon (to Orange County) bites combined with the prowess of Chef Mehra's culinary talent have led to a well-loved restaurant, and we're excited to continue to drop by for some tastiness. We started with a few snacks as we waited for others to arrive. 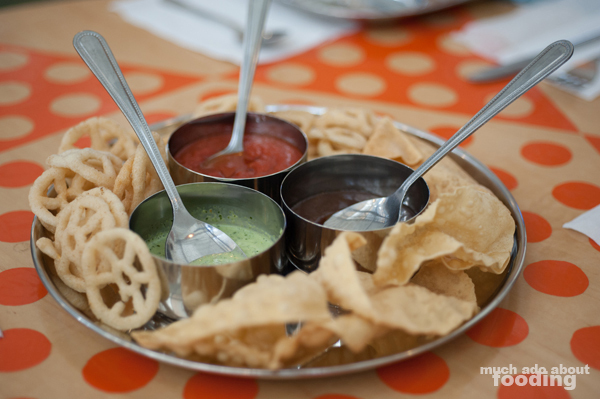 Served up were Papadum with tomato chutney, mint chutney, and tamarind chutney as well as Puffed Lotus Seeds on the table. The chutneys are always well-balanced and come with a zing so they held up again this time around. 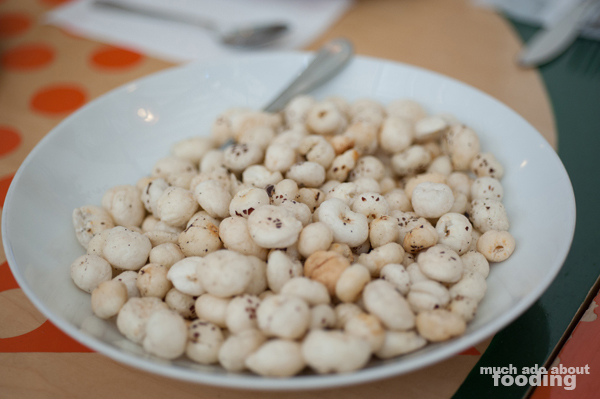 I hadn't seen puffed lotus seeds before but they were addictively easy to eat and slightly seasoned too with black pepper. 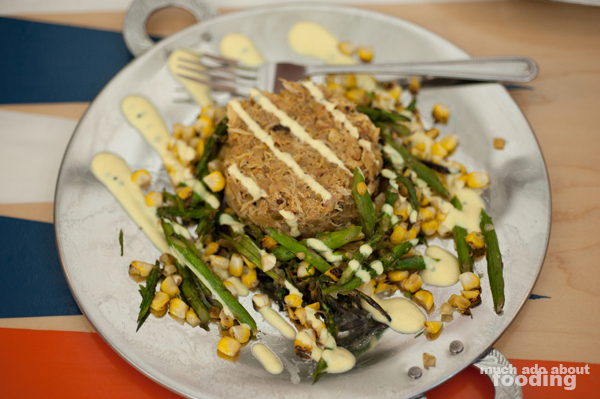 If you want some savory crab for part of your meal, aim for the Crab Masala which is accompanied by corn, asparagus, and mustard yogurt. 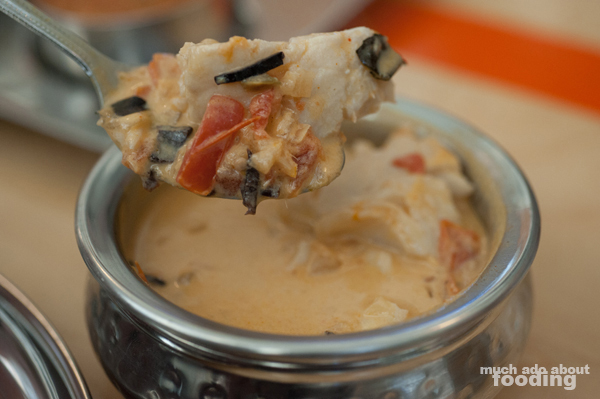 It is a wetter mix of textures and tastes with plenty of bold flavors. 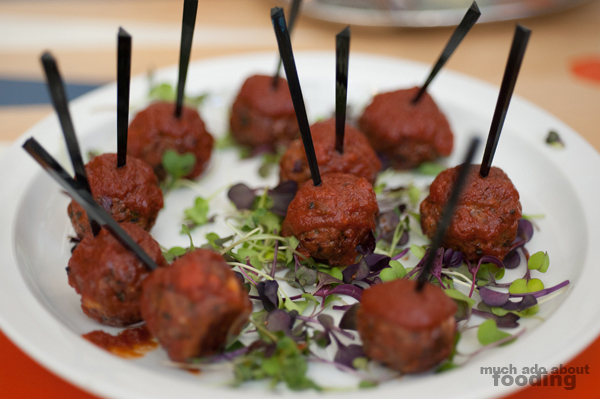 If you prefer a sweet and spicy bite, their Lamb Kofta with a tomato tamarind glaze can sate your cravings but be warned, it can bring a lot of heat! One of the most popular ways to enjoy ADYA's food is with their Thali offering. Here you get rice with side dishes of your choosing which give a more expansive view of flavor profiles and the extent of the menu. Our spread for the evening included Dal Makhani (black lentils), Chicken Tikka Masala, Avocado Raita, salad, and Kokum Fish Curry. I've raved before about the dal makhani and the raita and was very happy to see that their profound effect did not diminish after the year - still well made and expertly done. 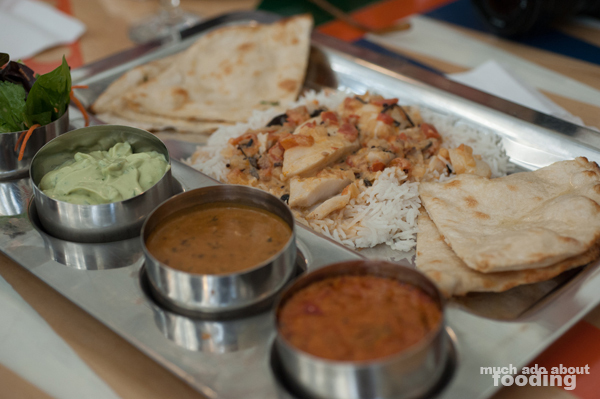 The portions seem quite copious for the Thali and tend to the need of people to try a little bit of everything. No wonder it's popular! To end the evening, we were brought into the world of innovative Indian desserts. 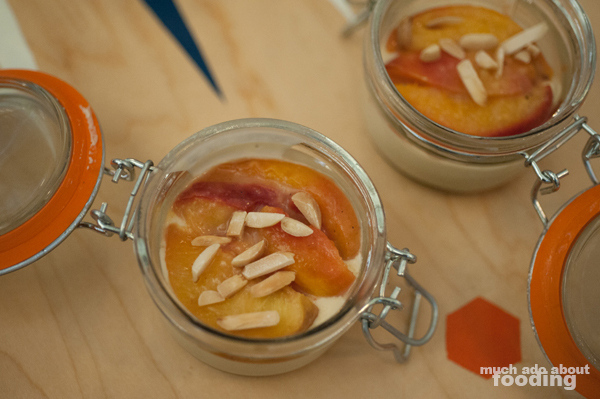 Jars of Chef's White Chocolate Rabri and Cardamom Grilled Peaches were unexpected delights. The rabri reminded me of a less firm pannacotta, creamy yet thick and very much on the sweeter side of custard-like dishes. With the bit of white chocolate (done better, of course, than my own white chocolate panna cotta), the dessert had just the right tinge of sugar and followed by the grilled peaches infused with cardamom, the right amount of floral and savory notes. 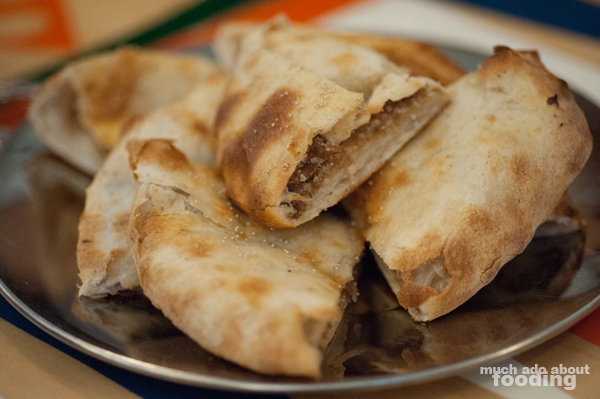 We then finished with some warm Date and Coconut Naan, reminiscent to me of a Vietnamese dessert with similar ingredients. Sweet and full of coconut, this was out-of-this-world good and so comforting. 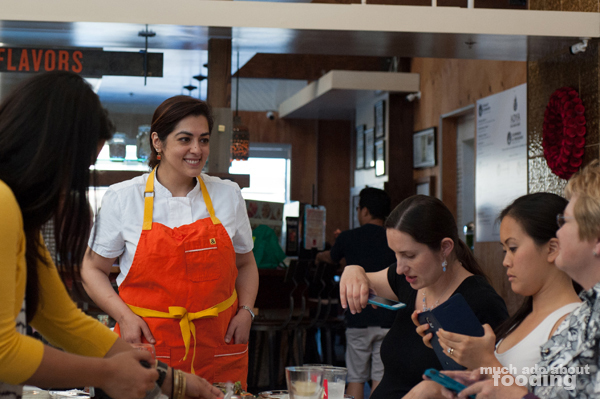 Congratulations to Chef Shachi and her crew on your successful first year. It is not a surprise considering how great your food is. Cheers to many more fruitful years to come!